Never run out of storage space on your phone again. 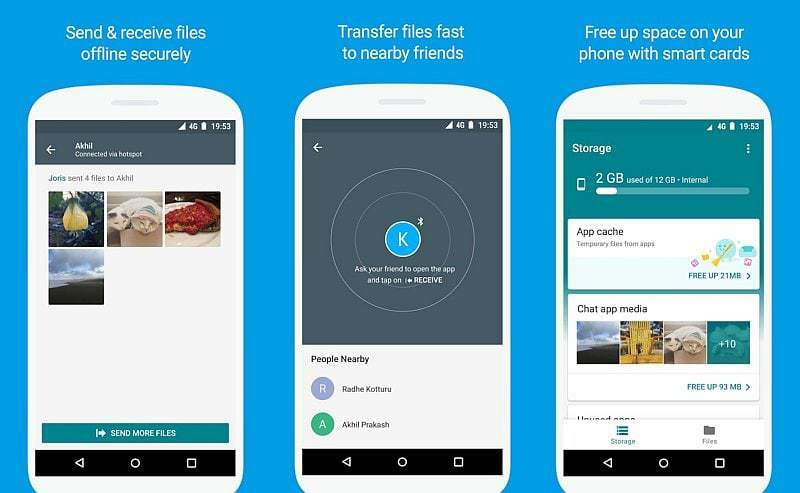 Files Go by Google is here, a ShareIt Killer too. Home > Latest > Hacks > Never run out of storage space on your phone again. Files Go by Google is here, a ShareIt Killer too. Often running out of storage space due to a large number of files accumulating every day? Most of the time it is because of WhatsApp images, videos and media data from other apps like Facebook taking over phone’s storage gradually. The factor adding up to the irritation is duplicate files. Google has come up with a new fix to these problems. “Files Go”. An app Google released in beta now takes control of your phone’s files and suggests optimal decision to keep your precious phone spade free and backed up. The app also finds out duplicate content/files in your storage and analyzes and classifies the important and non-important files. Offers a simple way to back up your important files to be backed up in Google Drive in a single click. If you’ve used ‘Google Photos’ app, you would be familiar with the basic actions of ‘Files Go’. But ‘Files Go’ extends the features to other types of files in addition to the photos and videos shooted by your phone’s camera. The app is in beta version anticipated to be enfolded with few more great features in future. Files Go offers a way to share large quantity files over tethering, in other words ‘without internet’. The files are encrypted during sending, this means it’s secure. I’ve already mentioned in my previous post about ‘42 Chinese Sypware Apps‘ warned by Government of India. ShareIt is on the top of the list believed to be a potential spyware possibly collecting your personal information. So it is good to choose ‘Files Go’ over ShareIt. This app transforms your old android phone into a spy security tool.